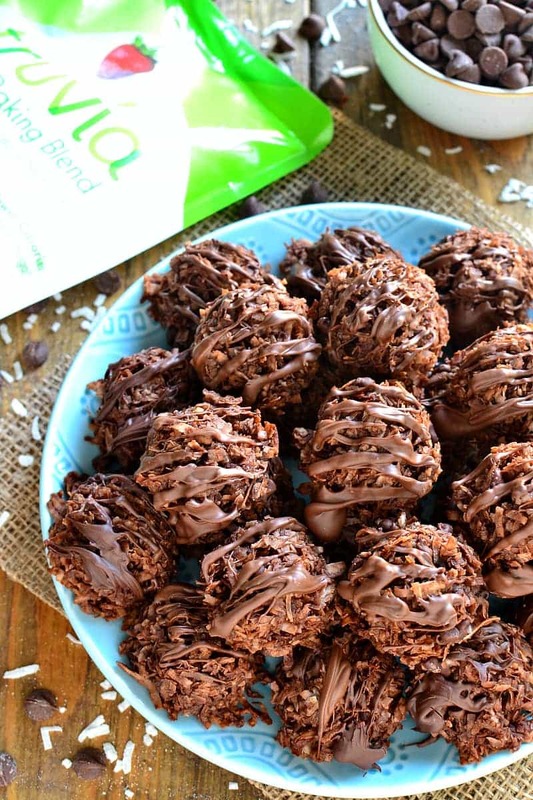 Double Chocolate Coconut Macaroons are loaded with rich chocolatey flavor and sinfully delicious coconut – the perfect twist on a classic! You guys. We’re doing something this weekend that I can honestly say we haven’t done since having kids. EVER. We’re going to Chicago! On an overnight! Kid-free! I might be a little excited. To be honest, it happened totally on accident. Because we missed out on tickets to Jim Gaffigan and felt desperately in need of another comedy show to take its place. So we started searching online…. and, low and behold, we found a show in Chicago. For this Friday night. With Jerry Seinfeld. In case you don’t know, Seinfeld is Jorden’s absolute favorite. And this isn’t our first time seeing him. Don’t even get me started on the time we ended up at the same bar as him after the show…..! Let’s just say Jorden may or may not have approached him….and may or may not have touched his arm….and may or may not have been very close to being restrained by security. But that’s a story for another day. For today, let’s talk about Chicago! And the fact that 24 hours from now we’ll be heading there for a day full of fun and laughs and much-needed adult time. I can’t wait to check out Chicago at Christmas time, grab some dinner and drinks, maybe do some shopping, and get in some serious laughs. All while my parents have the kids. It almost feels too good to be true….and I know it’s going to be amazing. And once we get back? 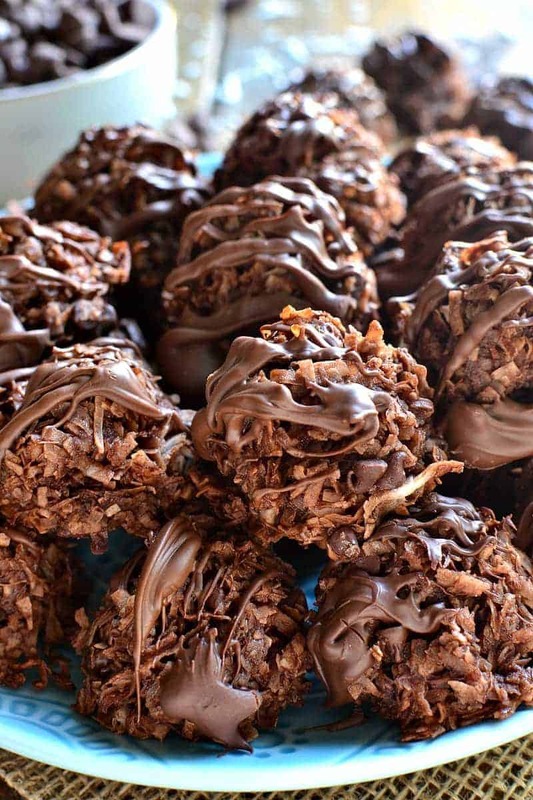 It’s time to get going on our cookie list…starting with these Double Chocolate Coconut Macaroons. 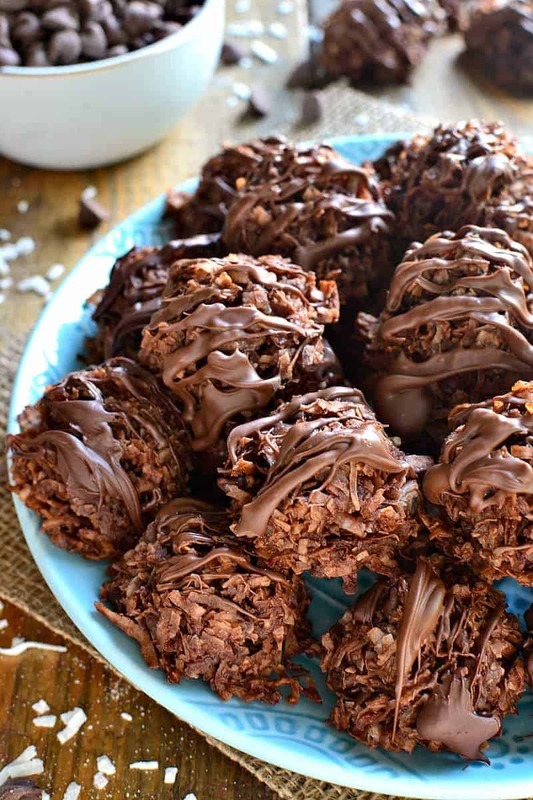 I love coconut macaroons, and I love them even more when they’re loaded with chocolate! But the thing I love most about these little macaroons is that they’re lightened up with Truvia…..which means they have all the delicious flavor without all the sugar. The perfect addition to your holiday cookie plate. But first….Chicago calls! 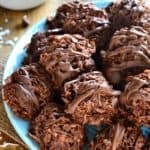 These Double Chocolate Coconut Macaroons are loaded with rich chocolatey flavor - the perfect twist on a classic! Heat oven to 325°. Line a large baking sheet with parchment paper. Whisk together egg whites, Truvia Baking Blend, vanilla and salt until Truvia is dissolved. Fold in cocoa powder and coconut, stirring until evenly combined. Stir in 1/4 c. mini chocolate chips. Using a ⅛ c measuring cup or ice cream scoop, drop the batter in mounds 1 inch apart on baking sheet. Melt remaining 1/2 c. chocolate chips (add a small amount of shortening to aid in melting) and drizzle over macaroons. A great chocolate dessert needs a drink to enjoy with it! Try my Strawberry Coconut Bellinis! Cathy, have a GREAT date weekend, enjoy Jerry and safe travels! It’s important for mom and dad to get away and enjoy yourselves every once in a while. It’s fun! These macaroons are incredible and will be perfect for my holiday cookie trays. This recipe is so so brilliant. Definitely sign me up for double chocolate anything! What a great Jerry Seinfeld story! Wowza! And these cookie! I saw these in my feed earlier today and can’t get over how wonderful they look! Nice! Love the Seinfeld story 🙂 These macaroons look so amazing!! If I can’t get Truvia how much sugar should I use or would Splenada work and how much ? These look delicious . 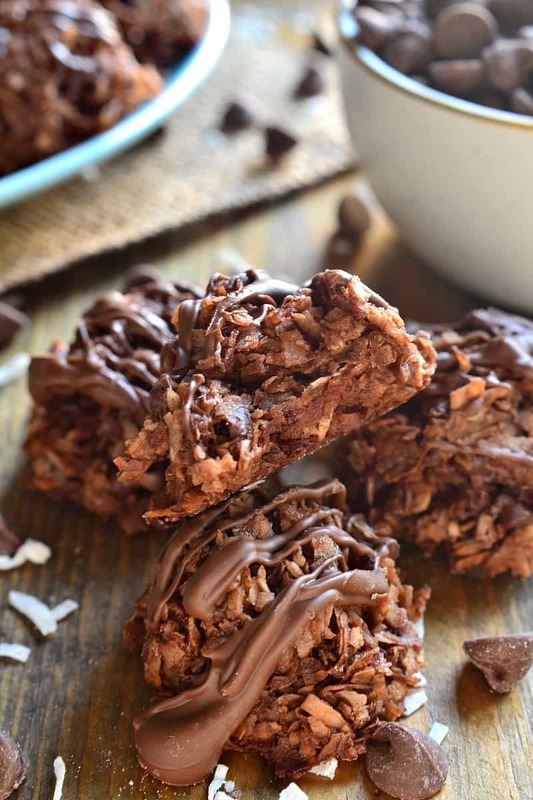 These look so decadent and I love that you made them with Truvia to help make them less “dangerous”! I hope you have a wonderful weekend getaway my friend! These look so delicious!! Have fun at Jerry in Chicago… and being kid free!! They look so amazingly good. I ‘m going to have to try these. I will take double chocolate anything…any day. These look unbelievable! I have a bag of coconut and am going to have to make them! I also would like to use real sugar instead of the Truvia. . . how much would you recommend? Thanks and Happy Holidays! You can replace Truvia with real sugar by doubling the amount called for in the recipe, so in this case, 1/2 cup. 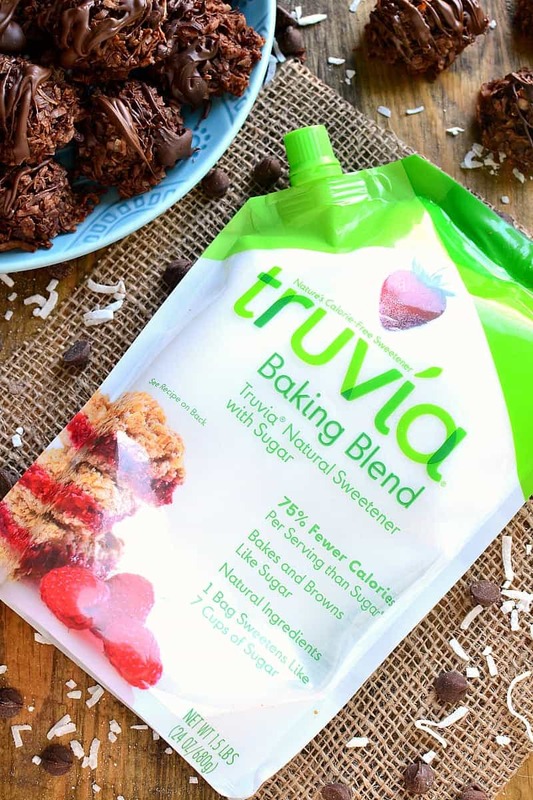 On the Truvia website it shows that 1/4 cup of the Truvia baking blend is equal to 1/2 cup sugar. 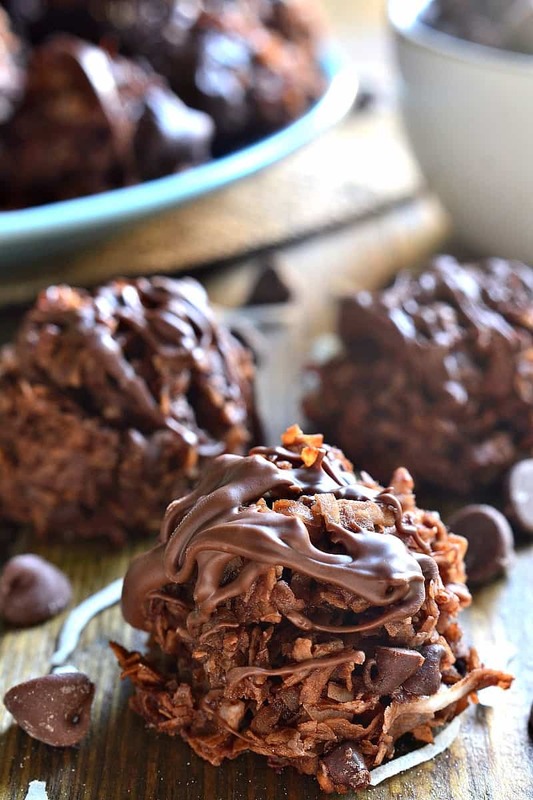 Double Chocolate Coconut Macaroons | Lemon Tree Dwelling. of these comments come across like coming from brain dead visitors?